Thank you for joining me as we count down to the MFT release. We are three days away from the big day! All the new Stamps, Die-namics, and Stencils will be available on Tuesday, December 2 at 10:00 pm EST. Be sure to check out the MFT Blog to see all the new items being revealed today. Don't forget to leave a comment on the MFT Blog countdown posts, YOU could win one of the five $75.00 gift vouchers. 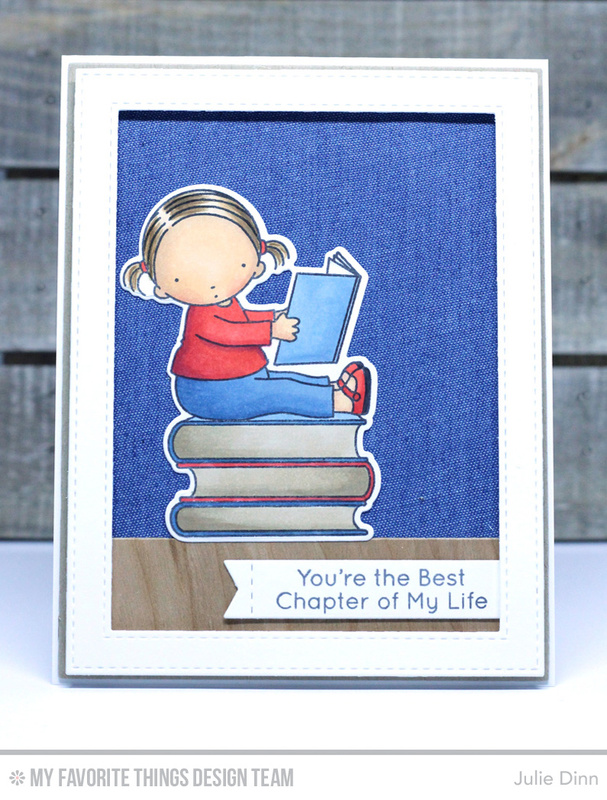 I have a sweet card to share with you today featuring the new Pure Innocence set Bookworm stamp set. This little cutie will get a lot of use at my house. I stamped the image on X-Press It card stock and coloured it with Copics. To add a little texture to the card I used a Denim sheet for the wall and a Cherry Wood Panel for the floor. This card is like frame, very beautiful. I liked the idea that you used the denim sheets as backcround. Love your coloring, and as a bookworm I would love to receive a card like this. Simply striking composition that sends your sincere message! Very cute. I like how you used the textured materials in this card. Cute as can be. The coloring is fantastic. This bookworm little girl is just cute and you made the books look so real. Would love to get this card in the mail!! !